1Opensesame is a state-of-the-art graphical, open-source experiment builder for the social sciences. 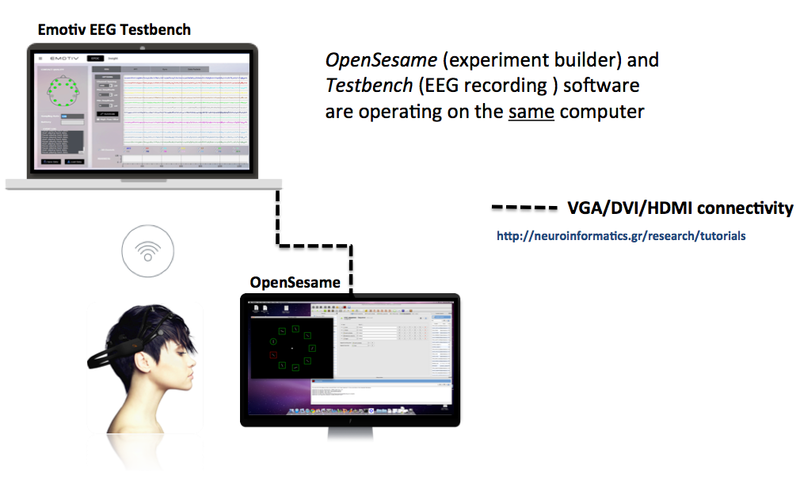 2Emotiv EEG Testbench is a raw EEG research data recording software included with the Research SDK of Emotiv EPOC. 3Emotiv EPOC is a revolutionary 14-channel wireless Brain Computer Interface and Scientific Contextual EEG device for research enabling entertainment, market research, usability testing and neurotherapy. * This is critical If you are using a modern version of OS X (>10.8), as due to OS restrictions a serial port -as expected by Testbench (/dev/cu*)- cannot be created otherwise. Thus, even if in the final setup this USB Serial adapter will not be used effectively, connecting it to workstation #1 will allow us to enable the required by Testbench serial port. For the purpose of this tutorial a PL2303 adapter was used and its appropriate driver was installed. socat installed in both Workstation #1 and #2.
socat is a relay for bidirectional data transfer between two independent data channels. Each of these data channels may be a file, pipe, device (serial line etc. or a pseudo terminal), a socket (UNIX, IP4, IP6 - raw, UDP, TCP),.., or a combination of two of these. These modes include generation of "listening" sockets, named pipes, and pseudo terminals. We will use socat to setup a UDP stream between the two workstations, linking a virtual serial port in each workstation with this stream. We wil also link each virtual serial port with another (physical or virtual) serial port in each workstation. The latter ones (serial ports) will be used by the corresponding software in each workstation (i.e. 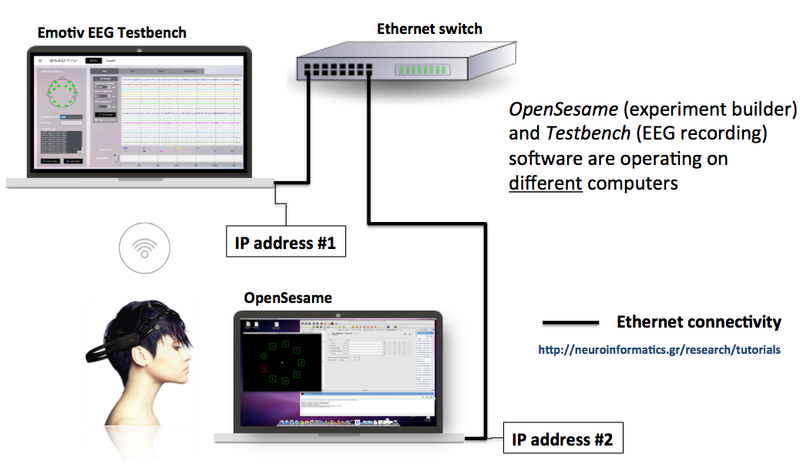 Testbench in Workstation #1 and OpenSesame in Workstation #2). Conventionally, both Emotiv Testbench and OpenSesame are supposed to be linked with a physical serial port to receive / send markers accordingly. Here, instead of connecting physical serial ports between the two workstations with a physical cable, we will be using virtual serial ports and a virtual 'cable' (i.e. UDP stream between the two network hosts) instead. Two (2) MacBooks (OS X) will be used here. OpenSesame is installed In Workstation #1 and Testbench is installed in Workstation #2. In Workstation #1, connect the USB Serial adapter in a USB port (after having installed its driver). Then, open Terminal application (found in Utilities) and use the following command in one line. This would setup a virtual serial port in UDP listening mode, using port 12345. Alternatively, you may download a bash script (UDP_receive-v2.sh) including the above from here. 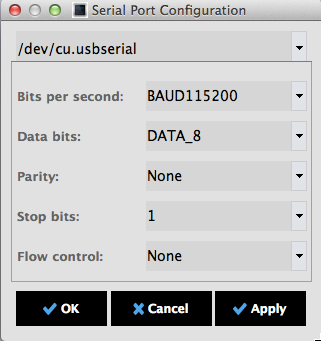 Now open Emotiv Testbench, go to serial port configuration screen, select '/dev/cu.usbserial' and configure appropriately (115200,8,N,1,N - see the second Figure of this tutorial). Alternatively, you may download a bash script (UDP_send-v2.sh) including the above from here. Finally, you may now switch to OpenSesame and use the following example code in an 'inline script' to send a marker of '3' to the remote host (and finally to the marker channel of Testbench). Using Linux in either side is almost transparent for this tutorial. Actually, you do not even need a USB Serial adapter. Your serial port names will slightly change (rename /dev/cu.usbserial and /dev/ptyS13 to /dev/tty..). Using Windows is supposed to be transparent as well, providing that the use of socat will prove transparent (i.e. as any other porting of Unix/Linux packages to Windows). Although this is beyond the scope of this tutorial, this would be a good starting point. The use of wireless ethernet interfaces to build the proposed network topology is strongly discouraged. This would induce an unpredictable jitter (it could even make your results useless). If your research involves ERPs/EPs, the above setup is not recommended; the whole distributed setup (2 workstations + network device) will probably add an additional delay of 1-2 ms (i.e. induce a potential jitter of [7~15] samples for Emotiv EPOC or a jitter of [4-8] samples for Emotiv EPOC+). If your research involves ERPs/EPs, please adapt your setup into a collapsed scheme (see Fig.3) using one workstation/OS for both software. Then, its loopback (localhost/127.0.0.1) network interface can be used to connect the two virtual ports(sockets). The scripts provided above can be easily adopted, accordingly. Again, a bash script (UDP_localhost.sh) is available for your convenience (for OS X). If Windows are to be used, a more simple alternative to create and link two (2) virtual ports may be followed. This setup has also been tested and proved reliable. Would you like to cite this work?